Learn how Stockwell Elastomerics does it. Why Work with Stockwell Elastomerics? Stockwell Elastomerics provides custom gaskets for the fast paced and demanding requirements of the technology equipment sector, where service conditions often require high performance materials such as silicone rubber. Design & Engineering – Stockwell Elastomerics’ engineers work closely with customers to help select materials, resolve design challenges and suggest manufacturing processes that best fit the specific application. 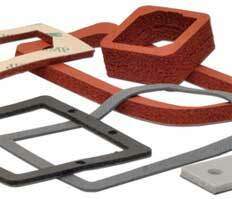 Material Solutions – Stockwell Elastomerics’ core business is silicone rubber. In stock is a comprehensive inventory of silicone and other engineered materials that are designed and manufactured to exceed the requirements of the most demanding technical gasketing, sealing and cushioning applications. Experienced Staff – Stockwell Elastomerics’ people make the difference – cross-trained staff is dedicated to providing quality products. In-house CNC cutting, die cutting, water jet cutting, compression and injection molding, and adhesive lamination, supported by comprehensive inventory, complete the competitive advantage.